I stumbled across the Death Star case from Hotwheels and picked one up to try it out. I found that, stock, it can likely work as is with a bit of work and limited fleet build selection but I wanted to make it work for any 300 point fleet build so I went to work (this was before the tournament changed to 400 points as a standard). First, I cut out the back to drop the “deck” and allow for smaller bits to lay flat. Next I pulled the back off and spray painted the non-station part black so that the main case stood out. The entire case is too small to fit the main range ruler so I cut slots in that back piece so the ruler could slide through and just have a little bit sticking out. The case itself has these handy shelves that actually detach and allow for quite a bit of customization. Taking out one of the middle shelves allows for 3 VSDs or 3 AFIIs pretty easily. I didn’t want to go with custom foam since I wanted this case to be pretty flexible and custom foam for this would be pretty complicated and kill a lot of the space inside. As you can see, I can cram quite a bit of content in there. It’s actually everything I need for a full 300 pt tourney list. I also like the VSD + GSD + Fighter/Bomber list out there and this case would accommodate that pretty easily. The triple VSD fits as well but I’d be concerned about the VSD antenna. To ensure everything doesn’t just spill out when I open the case, I cut up some of those clear packaging pieces and placed them in using the natural contours of the plastic shelves to hold them in place. It doesn’t mess with the aesthetics and holds everything while the case is opening. I could have just thrown Fighters in a little bag but some spare core set cardboard and these little plastic containers at Container Store just begged for a nice little Hangar. This case is definitely not for everyone and who knows if it will be able to hold Wave 2 ISDs and beyond but it was a fun little project and it holds up pretty well as a straight up tourney case. 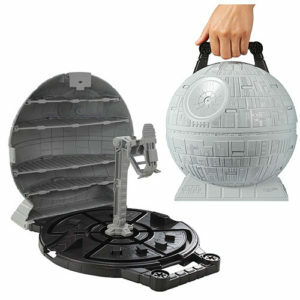 Also it stands up pretty well as a great Death Star prop (almost worth it for that reason alone).